The Spulboy Neptun T2000 is an exclusive Brush Glass Washer with open rinsing, easily and elegantly washing all glasses for liquer and beer up to a depth of 240mm. Fast an easy to use, only one container needs cleaning. 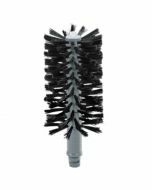 A huge benefit to the Spulboy Brush Glasswasher is that there is no need to leave your electric machine on all day. Save your larger capacity cabinet glasswasher for busy periods, lowering energy consumption, maintenence costs and eliminating expense. Spulboy took up a challenge and ordered a series of tests at the renowned Fraunhofer Institute. The Fraunhofer Institute for Biomedical Technique (IBMT) was testing the antimicrobial effect of Spulboy on the surface of glasses. The series of experiments included three runs, with 5 glasses each, using original Spulboy glass washing tablets. The results, whilst cleaning with cold water, discovered that germs like Escherichia coli or the especially resistant Pseudomonas aeruginosa had no chance! 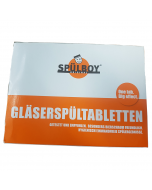 Spulboy Brush Glasswashers do not require washing in hot water. This brings incredible benefits if you are washing printed glassware as the printed designs will not fade or wear off with brush washing. 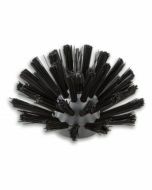 Unlike a cabinet machine, the washing process with a brush washer is much more gentle. This makes it much more suitable for fragile glassware such as crystal wine glasses. Using a glasswasher on the move can be incredibly difficult. Cabinet machines for event catering are notoriously hard to set up and get services too. 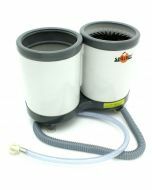 A Spulboy brush glasswasher can be portable and therefore very easy to move with. 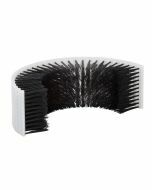 Spulboy Brush Glasswashers are often used as an addition to a cabinet glasswasher just for cooling of the glass and that added layer of cleaning. 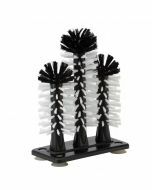 Owning a Spulboy allows you to have added washing capacity at peak periods and also gives you a backup for when and if your cabinet glasswasher fails. Heavily soiled glassware such as frappuccino's, milkshakes and smoothies are notoriously difficult to wash in an electric glasswasher. Getting enough water flow to remove debris and also preventing food debris from blocking filters and pumps can be hard. Spulboy glasswashers eliminate this issue and that's why Spulboy glasswashers can be found in Starbucks restaurants in Germany, Switzerland & Austria. 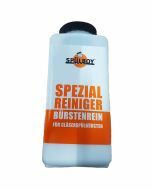 Spulboy Glasswashers are commonly used to pre-wash glasswashers before putting them into the electric cabinet machine. This again adds a second layer of cleaning to ensure your glass is spotless. Spulboy glasswashers massively increase carbonation of drinks and improves head retention and beer taste. That's why they are approved worldwide by the Heineken Brewery and recommended to publicans serving Heineken. Compliant with UK legilation for glasswashing, it is guaranteed to fit 99% of UK sinks up to 330 x 190mm. Each unit is supplied as standard with WRAS approved connection hoses for connection to a standard UK Tap.